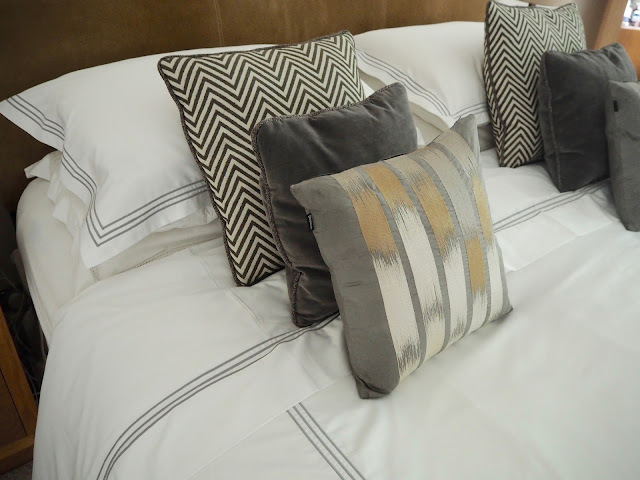 So one of the highlights of being stuck in my bed for much of April and May was being sent the most DIVINE bedding from Foxford Woollen Mills. 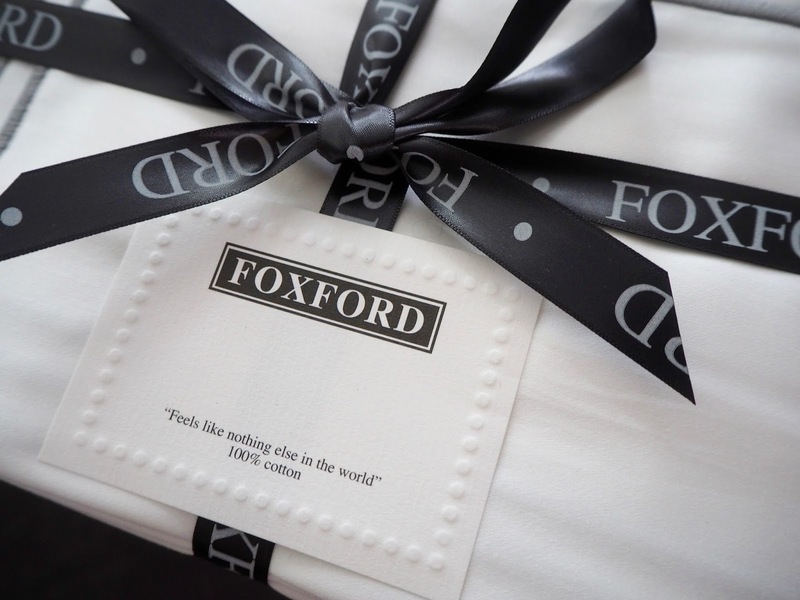 Foxford Woollen Mills is an Irish company which was started in a convent in Foxford, Co Mayo, on the River Moy. Now my mum is from Mayo and we always had Foxford blankets in our house and in the car. Everyone had a checked blanket in their car in the 1970's and 80's. It was the law. But as well as that family connection to Mayo, Foxford actually have a shop closer to me in Dungannon - as part of the Linen Green development in Moygashal and in fact, they stock our Field Day candles. Additionally, the team from Foxford came to meet me at the Showcase Trade Show I attended in Dublin in January and were so impressed with the new range that they now stock it in the Mayo shop too. Anyway, when the team at Foxford heard I was unwell, they offered to send me some 'posh' bedlinen (my words, not theirs) and despite pain and drugs, I actually 'staged' the bedroom like a proper blogger. Much to my husband's dismay as everything he likes to have to hand on his bedside locker was hidden away in the drawers! But how gorgeous it looked for all of an hour. But there's the secret of every curated interior shot you see online...ALL THE CRAP IS IN THE DRAWERS!! Oh and how *do* they get the sheets so wrinkle free. Photoshop? 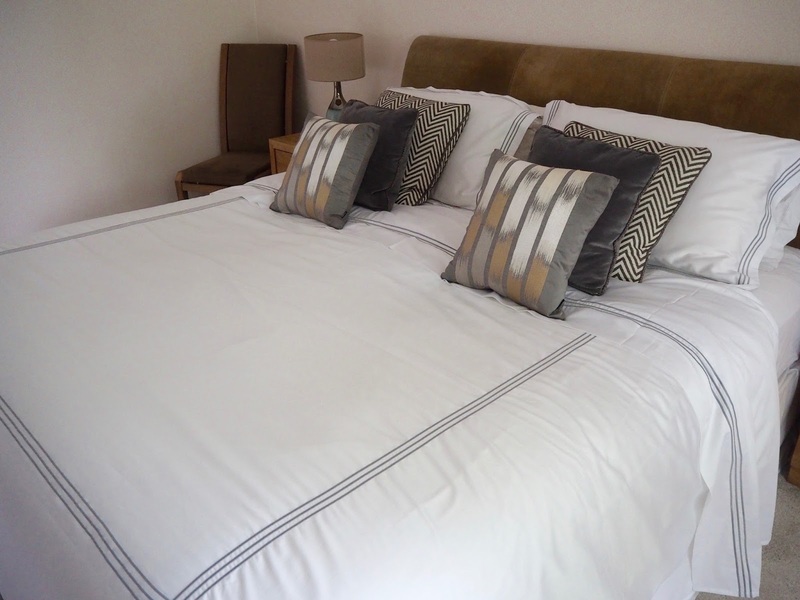 I was sent the 3 Row Decor Stitch bedding in Silver from their Hotel Range - I was sent a duvet cover, 2 x pillowcases and the flat sheet for our Super King bed. Yes, it's massive....all 3 kids can fit in it with us on the weekend mornings for reading and cuddles. 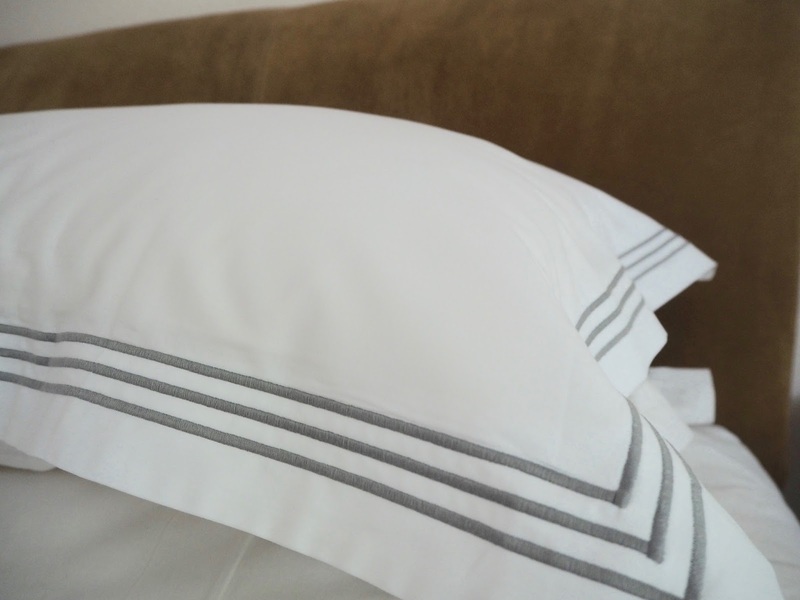 The bedlinen is made from a sateen material so it's soft and silky - it's difficult to show the softness of the fabric in a photo. Remarkably, it's 100% cotton...it seems like it's too soft to be cotton. By the way, I can confirm that it's not too bad to iron. Does anyone else have the 'husband vs cushions on the bed' issue in their home? Men seem to hate cushions on the bed. They just don't get the point. But how fab do they look? They give me so much pleasure every morning after I've made the bed and I love walking back into the room during the day. 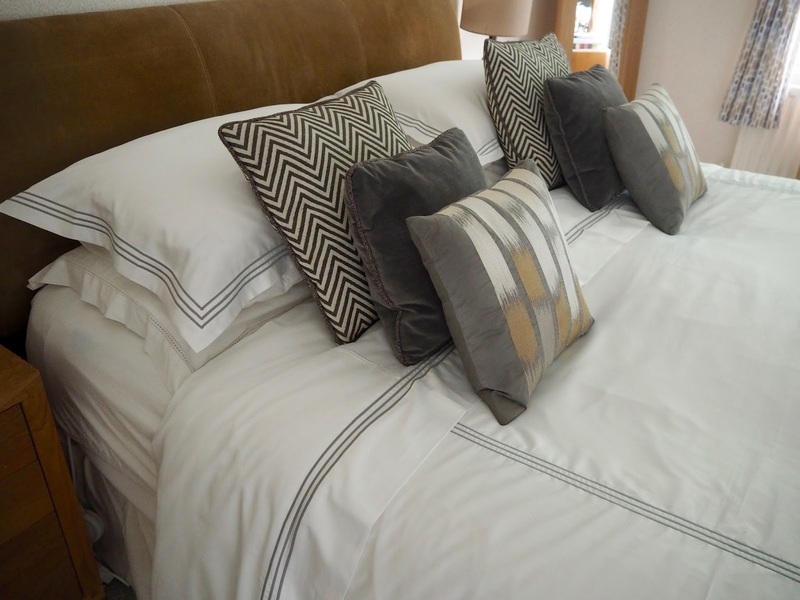 There really is nothing like a freshly made, well dressed bed. My cushions are a mixture - the two at the back of each pile actually came with my sofa and I replaced them with shop bought ones - just to change up the sofa a bit. The one at the front is from Bedeck, bought from their factory shop outside Moira a couple of years ago. The great news about this gorgeous bedlinen is that it's on sale at the moment with 30% off. But I'll warn you, posh sheets are a dangerous addiction as I'm currently sat with the Bone colour way in my basket trying to justify. After all, it's something you have for years and years and it gets washed, dried, ironed and put back on the bed again and again. The last time I bought nice bedlinen for this bed was when we moved into our last home - 13 years ago!! So it's more than earned its worth. 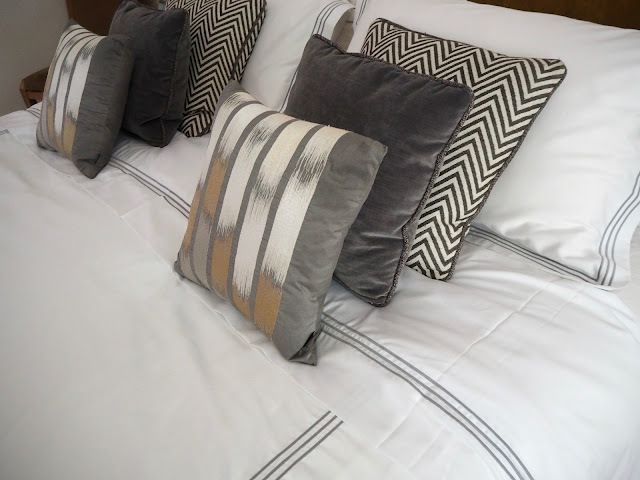 Oh and the husband was impressed with the new bedlinen, despite his grumblings about everything being in drawers and fancy schmancy cushions all over the bed. That's saying something! 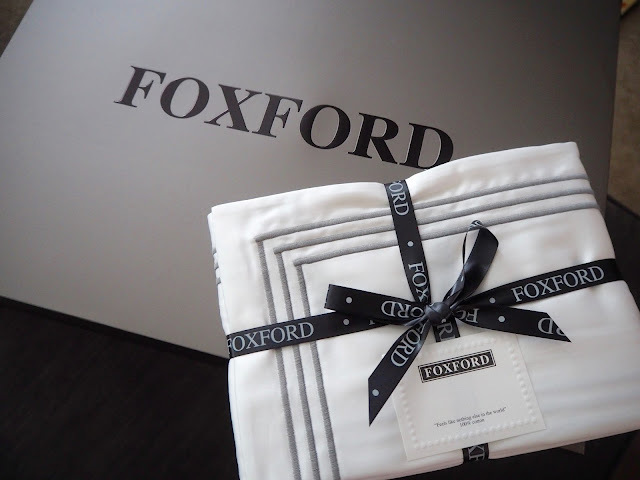 Hi Avril, I'm from Mayo but live in NZ now and my mum often brings bed linen or blankets from Foxford Woollen Mills as gifts when she comes to visit us. The quality is pure luxury and everything is a true classic, so well worth the investment! My husband is another who just doesnt "get" cushions on the bed, so you are definitely not alone! This bedding looks so cozy and chic!